Home announcements Application iPhones Review App Beweather for iPhone users is available in iPhone stores. App Beweather for iPhone users is available in iPhone stores. 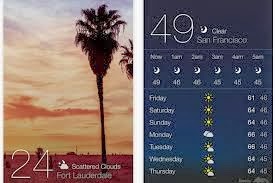 App BeWeather was released on January 17 in iPhone stores. BeWeather is modern and visually amazing weather App, it supplies all the weather information you need. This App is very useful and is very easy to use. App BeWeather is extremely popular weather App for Black berry but finally it was released for iPhone users and it brought all the best features to iPhone such as: current conditions, temperature, daily & hourly forecasts, alerts and more. It looks amazing from top to bottom. It’s available not only in U.S. but in Canada and Europe too. If you want to upgrade to BeWeather Pro via an in-app purchase, you can do so for $2.99. This gives you even more data including up to the minute forecast data that you can access for all supported locations by just tapping on the hourly forecast. The pro version also includes things like push notifications for weather alerts in your area. You can download BeWeather App free.